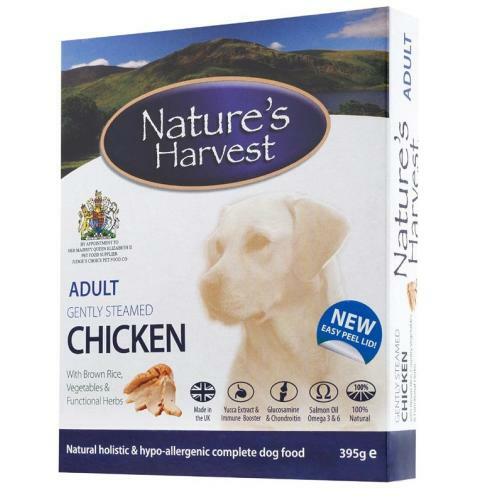 Nature’s Harvest Gently Steamed Chicken for the adult dog is formulated to match your canine’s natural diet. Made with the finest ingredients, succulent chicken, vegetables and whole brown rice which is suitable for dog’s with sensitive stomachs. With added Salmon Oil to support joint functions and Vitamin C for antioxidants which helps the immune system. Chicken 60%, Brown Rice 5%, Vegetables, Peas 2%, Carrots 2%, Salmon Oil, Seaweed, Mixed Herbs, Glucosamine, Chondroitin, Yucca Extract, Cranberry Extract, Yeast Extract. Protein 10%, Fat Content 8%, Crude Fibres 0.3%, Crude Ash 3%, Moisture 72.5%, Vitamin A, Vitamin D3, Vitamin E, Zinc Sulphate monohydrate, Iron Sulphate Monohydrate, Copper Sulphate,Pentahydrate, Manganese Sulphate, Calcium Iodate Anhydrous, Sodium Selenite.